Fiona Harrison is a professional singer who specializes in music from the 1880s to the 1960s. 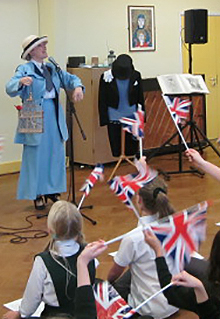 Based in Leighton Buzzard in Bedfordshire, Fiona regularly visits schools and, through the wonders of music and costumes, takes children back to a time of gas lamps and Music Hall, the Blitz and the 1940s. 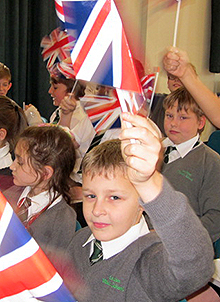 To tie in with the national curriculum, Fiona has two sessions to offer. 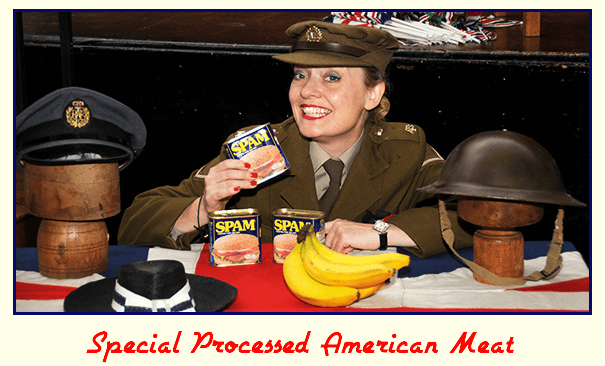 Her first, and most popular, is her World War Two show – “We’ll Meet Again”. 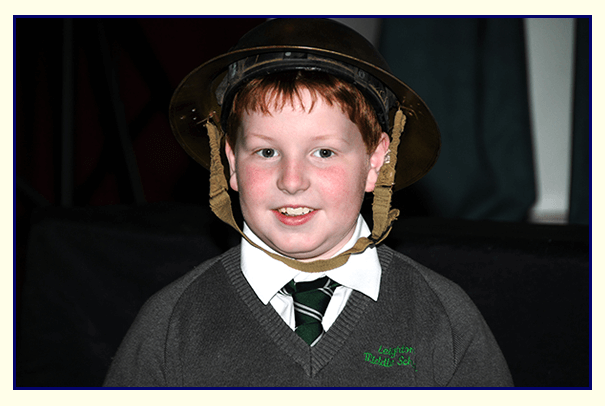 The second, “Pack Up Your Troubles”,focuses on the Music Hall stage and how music was used as a means of escapism and for the recruitment of young men during the First World War. This show can also be adapted to suit a Victorian scenario, creating a possible third option. 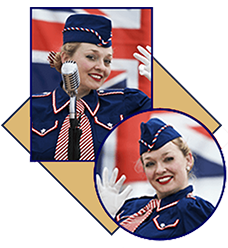 This session concentrates on 4 different types of music – Big Band and Swing, Sing-along, Patriotic and Novelty songs and focuses on how social events brought about the changes in popular music during WW2. 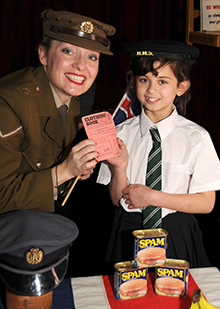 During the show Fiona will touch on important dates, the effects of rationing, and encourage lots of audience participation. 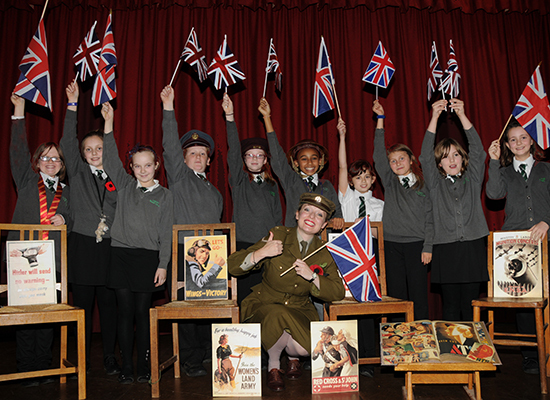 The children will be asked to clap along, join in with actions and sing along to numbers such as “The Army the Navy and the Air Force”, “Yes We Have No Bananas”, “Kiss Me Goodnight Sergeant Major”, “Boogie Woogie Bugle Boy” “Roll Out The Barrel”, “The White Cliffs of Dover” and “We’ll Meet Again”, to name but a few. 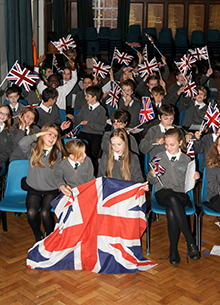 Fiona brings song sheets, props, visual aids and flags, but as a fore runner to her visit, teachers may wish for the children to have made their own Union Jack flags, which they can bring along and wave at the end of the show. 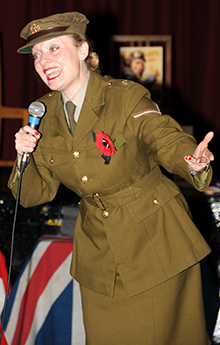 For this performance Fiona comes dressed in her WW2 ATS Army uniform; her hair is neatly rolled up off the collar and her shoes and buttons are always beautifully polished – all adding to that extra special touch of 1940s authenticity as she puts the children through their paces! 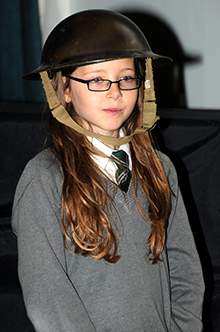 This session is all about the Music Hall and how music was used as a means of escapism during the Great War. 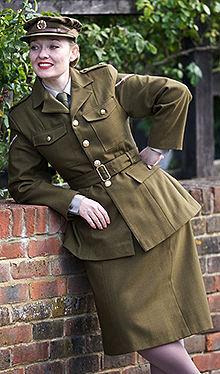 Fiona comes dressed in her WW1 suit and brings along two mannequins which display a couple of her costumes. 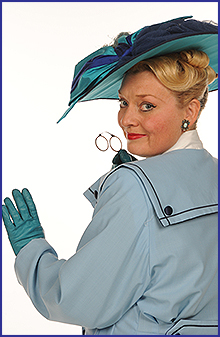 These include her Burlington Burtie top hat and tail coat and walking out tea gown. 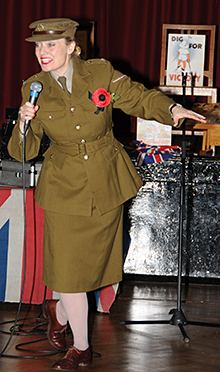 During the show Fiona will touch on recruitment and how songs were used to encourage young men to join up, plus an insight into some of the lyrics. 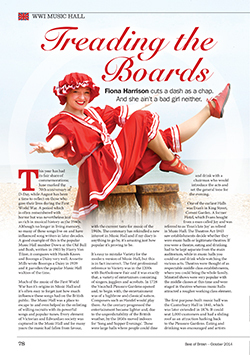 Children will be encouraged to clap along and join in with the music as Fiona talks about the Music Hall stars and their various styles, from the Swells to the Coaster entertainers. These will include Champagne Charlie George Leybourne, the Queen of the Halls -Marie Lloyd and Vester Tilly, whose act involved dressing up as a man and how she helped with recruitment. 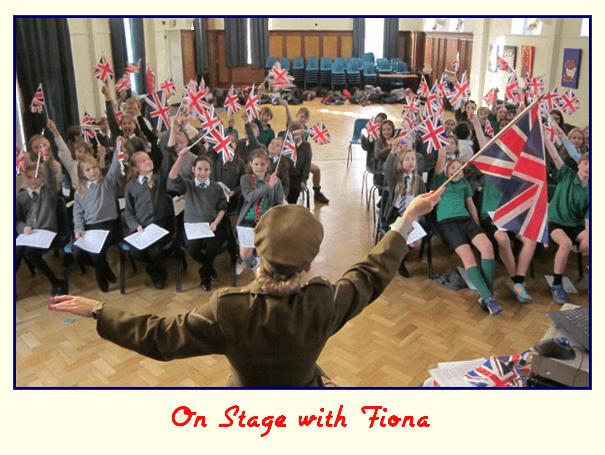 During the show Fiona will sing “Down at the Old Bull and Bush”, “Fall in and Follow Me”, “Good Bye-ee”, “It’s a Long Way to Tipperary”, “Don’t Dilly Dally on the Way” and many more, while providing song sheets and flags which the children can wave at the end. 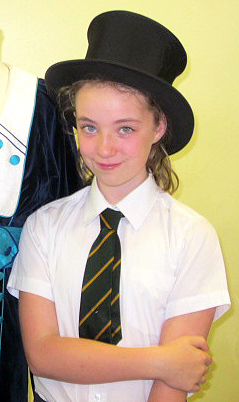 For schools who have been studying the Victorians, this show can easily be adapted to make the subject matter more relevant, while Fiona swaps her WW1 suit for a Victorian bustle! 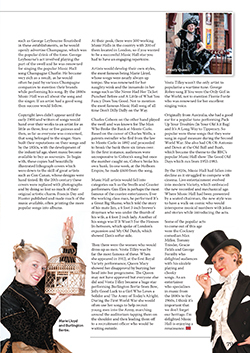 To find out more about the Music Hall stage teachers may wish to draw reference from Fiona’s article which was printed in the Best of British magazine. 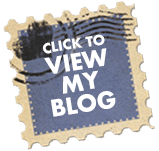 To see an enlargement click on each page in turn. Both of the above programmes are designed to run straight through for 40 minutes, to suit school timetables, but this can easily be lengthened to 60 minutes on request. 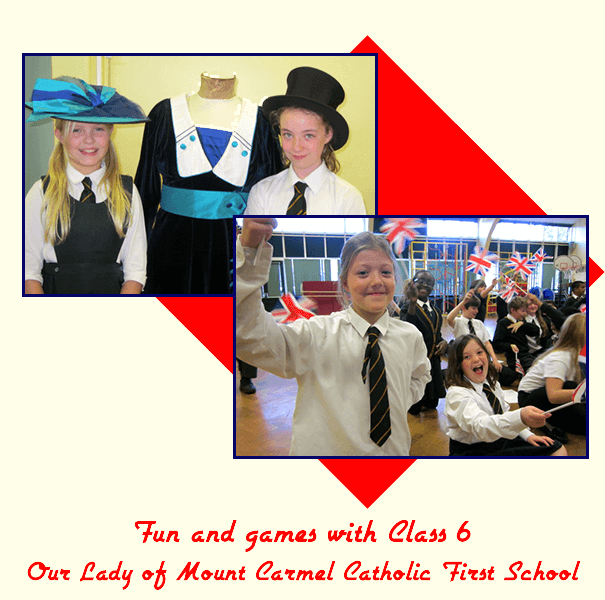 The ideal class size is 30 to 60 pupils and Fiona is happy to perform two classes back to back. 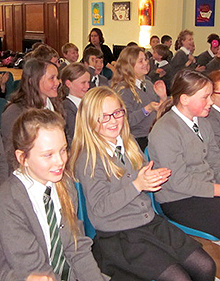 In junior schools teachers may prefer Fiona to perform a show to the whole school first and then take the appropriate class afterwards, explaining the songs in more detail. 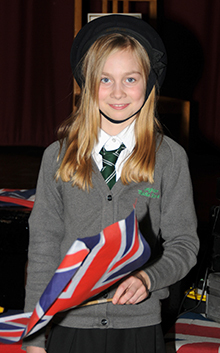 If you would like to book Fiona for your school, or have any enquiries, please click onto the request form below and she will be happy to answer any questions. 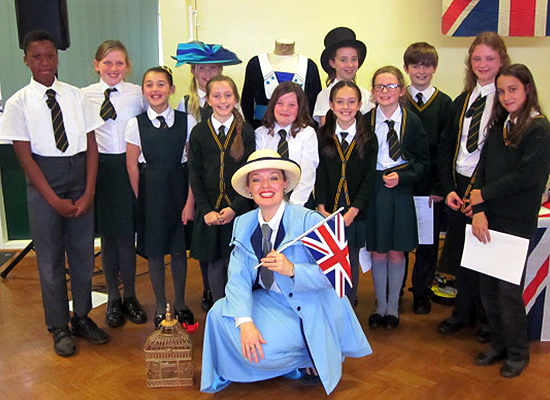 Although based in Bedfordshire, Fiona is prepared to travel anywhere in the UK and would be delighted to bring the magic of the past to your school! 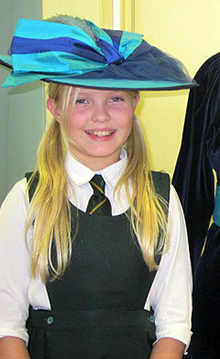 Suitable for ages 12 years and up-wards to adults, Fiona’s work-shop is all about building confidence and self esteem. Her lesson plan involves some basic breathing and singing techniques, teaching a round, splitting the class into groups and then bringing every-one together for a performance at the end. Fiona’s work shop lasts between 40 to 60 minutes and can happily be tailored to suit each individual client’s requirements. 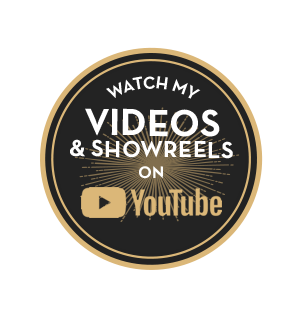 “Fiona’s voice is unique – her clarity, diction, range, strength, tone and delivery are all superb, while her mannerisms and personality demonstrate, at all times, an obvious love for music, performance and the stage. She is always very well presented, taking a great pride in her appearance and she is most polite, cheerful and enthusiastic. "Children - Pay Attention!" 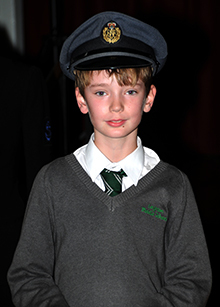 Dressed for Duty! 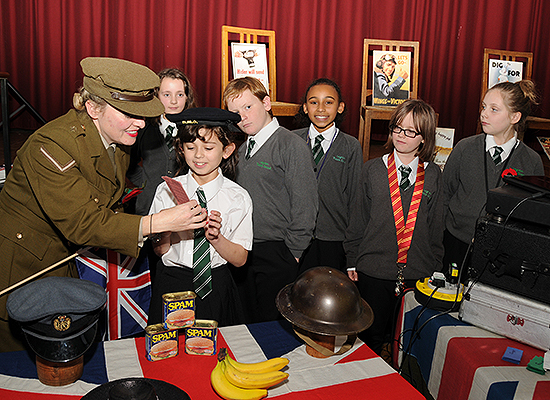 Wartime Rationing! This is the Army! Sing As We Go! In the Navy! Patriotic! Maisy Dotes! "Settle Down!" Don't Dilly Dally! Trying on Hats! Burlington Bertie! 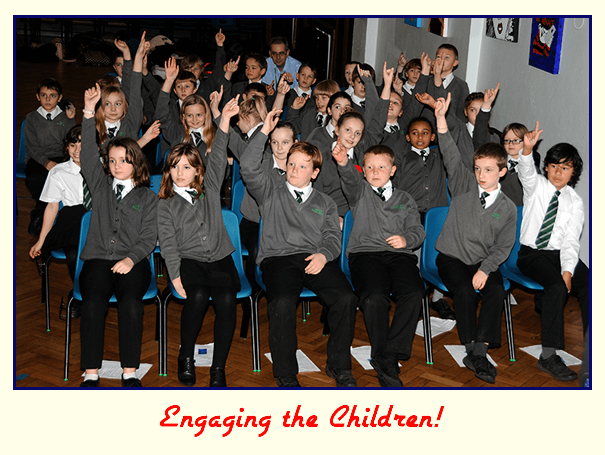 Clapping Along! Pack Up Your Troubles! The Air Force! Learning the Fun and Interactive Way!